I did not know I held so much goodness - all seems beautiful to me. How did the atmosphere evolve into what it is today? What gases in the atmosphere are important to life and how are they maintained? What natural variations occur in atmospheric constituents and what are the important time scales for change? After loss of the hydrogen, helium and other hydrogen-containing gases from early Earth due to the Sun's radiation, primitive Earth was devoid of an atmosphere. The first atmosphere was formed by outgassing of gases trapped in the interior of the early Earth, which still goes on today in volcanoes. For the Early Earth, extreme volcanism occurred during differentiation, when massive heating and fluid-like motion in the mantle occurred. It is likely that the bulk of the atmosphere was derived from degassing early in the Earth's history. The gases emitted by volcanoes today are in Table 1 and in Figure. Life started to have a major impact on the environment once photosynthetic organisms evolved. These organisms, blue-green algae (picture of stromatolite, which is the rock formed by these algae), fed off atmospheric carbon dioxide and converted much of it into marine sediments consisting of the shells of sea creatures. While photosynthetic life reduced the carbon dioxide content of the atmosphere, it also started to produce oxygen. 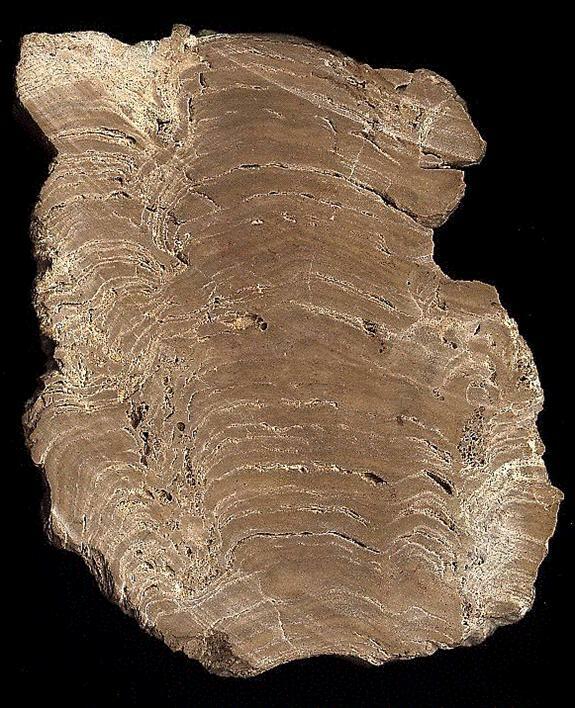 For a long time, the oxygen produced did not build up in the atmosphere, since it was taken up by rocks, as recorded in Banded Iron Formations (BIFs; picture) and continental red beds. To this day, the majority of oxygen produced over time is locked up in the ancient "banded rock" and "red bed" formations. It was not until probably only 1 billion years ago that the reservoirs of oxidizable rock became saturated and the free oxygen stayed in the air. The oxidation of the the mantle rocks may have played an important role in the rise of oxygen. It has been hypothesized the the change from predominantly submarine to subaerial volcanoes may have also led to a reduction in volcanic emission of reduced gases. Once oxygen had been produced, ultraviolet light split the molecules, producing the ozone UV shield as a by-product. Only at this point did life move out of the oceans and respiration evolved. We will discuss these issues in greater detail later on in this course. The Early atmosphere was probably dominated at first by water vapor, which, as the temperature dropped, would rain out and form the oceans. This would have been a deluge of truly global proportions an resulted in further reduction of CO2. Then the atmosphere was dominated by nitrogen, but there was certainly no oxygen in the early atmosphere. The dominance of Banded-Iron Formations (BIFs; see picture) before 2.5Ga indicates that Fe occurred in its reduced state (Fe2+). Whereas reduced Fe is much more soluble than oxidized Fe (Fe3+), it rapidly oxidizes during transport. However, the dissolved O in early oceans reacted with Fe to form Fe-oxide in BIFs. As soon as sufficient O entered the atmosphere, Fe takes the oxidized state and is no longer soluble. The first occurrence of redbeds, a sediments that contains oxidized iron, marks this major transition in Earth's atmosphere. Cumulative history of O2 by photosynthesis over geologic time. The start of free O is likely earlier than shown. Lava flowing from the partially molten interior spread over the surface and solidified to form a thin crust. This crust would have melted and solidified repeatedly, with the lighter compounds moving to the surface. This is called differentiation. Weathering by rainfall broke up and altered the rocks. The end result of these processes was a continental land mass, which would have grown over time. The most popular theory limits the growth of continents to the first two billion years of the Earth. and the first three steps were discussed in detail. The composition of the present atmosphere however required the formation of oxygen to sufficient levels to sustain life, and required life to create the sufficient levels of oxygen. This era of evolution of the atmosphere is called the "Biological Era." The biological era was marked by the simultaneous decrease in atmospheric carbon dioxide (CO2) and the increase in oxygen (O2) due to life processes. We need to understand how photosynthesis could have led to maintenance of the ~20% present-day level of O2. The build up of oxygen had three major consequences that we should note here. Firstly, Eukaryotic metabolism could only have begun once the level of oxygen had built up to about 0.2%, or ~1% of its present abundance. This must have occurred by ~2 billion years ago, according to the fossil record. Thus, the eukaryotes came about as a consequence of the long, steady, but less efficient earlier photosynthesis carried out by Prokaryotes. Figure 1. Photolysis of water vapor and carbon dioxide produce hydroxyl and atomic oxygen, respectively, that, in turn, produce oxygen in small concentrations. This process produced oxygen for the early atmosphere before photosynthesis became dominant. The hydrogen atoms formed in these reactions are light and some small fraction excape to space allowing the O2 to build to a very low concentration, probably yielded only about 1% of the oxygen available today. Secondly, once sufficient oxygen had accumulated in the stratosphere, it was acted on by sunlight to form ozone, which allowed colonization of the land. The first evidence for vascular plant colonization of the land dates back to ~400 million years ago. where carbon dioxide and water vapor, in the presence of light, produce organics and oxygen. The reaction can go either way as in the case of respiration or decay the organic matter takes up oxygen to form carbon dioxide and water vapor. Life started to have a major impact on the environment once photosynthetic organisms evolved. These organisms fed off atmospheric carbon dioxide and converted much of it into marine sediments consisting of the innumerable shells and decomposed remnants of sea creatures. Cumulative history of O2 by photosynthesis through geologic time. While photosynthetic life reduced the carbon dioxide content of the atmosphere, it also started to produce oxygen. The oxygen did not build up in the atmosphere for a long time, since it was absorbed by rocks that could be easily oxidized (rusted). To this day, most of the oxygen produced over time is locked up in the ancient "banded rock" and "red bed" rock formations found in ancient sedimentary rock. It was not until ~1 billion years ago that the reservoirs of oxidizable rock became saturated and the free oxygen stayed in the air. The figure illustrates a possible scenario. We have briefly mentioned the difference between reducing (electron-rich) and oxidizing (electron hungry) substances. Oxygen is the most important example of the latter type of substance that led to the term oxidation for the process of transferring electrons from reducing to oxidizing materials. This consideration is important for our discussion of atmospheric evolution, since the oxygen produced by early photosynthesis must have readily combined with any available reducing substance. It did not have far to look! We have been able to outline the steps in the long drawn out process of producing present-day levels of oxygen in the atmosphere. We refer here to the geological evidence. When the oceans first formed, the waters must have dissolved enormous quantities of reducing iron ions, such as Fe2+. These ferrous ions were the consequences of millions of years of rock weathering in an anaerobic (oxygen-free) environment. The first oxygen produced in the oceans by the early prokaryotic cells would have quickly been taken up in oxidizing reactions with dissolved iron. This oceanic oxidization reaction produces Ferric oxide Fe2O3 that would have deposited in ocean floor sediments. The earliest evidence of this process dates back to the Banded Iron Formations, which reach a peak occurrence in metamorphosed sedimentary rock at least 3.5 billion years old. Most of the major economic deposits of iron ore are from Banded Iron formations. These formations, were created as sediments in ancient oceans and are found in rocks in the range 2 - 3.5 billion years old. Very few banded iron formations have been found with more recent dates, suggesting that the continued production of oxygen had finally exhausted the capability of the dissolved iron ions reservoir. At this point another process started to take up the available oxygen. Once the ocean reservoir had been exhausted, the newly created oxygen found another large reservoir - reduced minerals available on the barren land. Oxidization of reduced minerals, such as pyrite FeS2 , exposed on land would transfer oxidized substances to rivers and out to the oceans via river flow. Deposits of Fe2O3 that are found in alternating layers with other sediments of land origin are known as Red Beds, and are found to date from 2.0 billion years ago. The earliest occurrence of red beds is roughly simultaneous with the disappearance of the banded iron formation, further evidence that the oceans were cleared of reduced metals before O2 began to diffuse into the atmosphere. Finally after another 1.5 billion years or so, the red bed reservoir became exhausted too (although it is continually being regenerated through weathering) and oxygen finally started to accumulate in the atmosphere itself. This signal event initiated eukaryotic cell development, land colonization, and species diversification. Perhaps this period rivals differentiation as the most important event in Earth history. The oxygen built up to today's value only after the colonization of land by green plants, leading to efficient and ubiquitous photosynthesis. The current level of 20% seems stable. Why does present-day oxygen sit at 20%? This is not a trivial question since significantly lower or higher levels would be damaging to life. If we had < 15% oxygen, fires would not burn, yet at > 25% oxygen, even wet organic matter would burn freely. The genetic materials of cells (DNA) is highly susceptible to damage by ultraviolet light at wavelengths near 0.25 µm. It is estimated that typical contemporary microorganisms would be killed in a matter of seconds if exposed to the full intensity of solar radiation at these wavelength. Today, of course, such organisms are protected by the atmospheric ozone layer that effectively absorbs light at these short wavelengths, but what happened in the early Earth prior to the significant production of atmospheric oxygen? There is no problem for the original non-photosynthetic microorganisms that could quite happily have lived in the deep ocean and in muds, well hidden from sunlight. But for the early photosynthetic prokaryotes, it must have been a matter of life and death. It is a classical "chicken and egg" problem. In order to become photosynthetic, early microorganisms must have had access to sunlight, yet they must have also had protection against the UV radiation. The oceans only provide limited protection. Since water does not absorb very strongly in the ultraviolet a depth of several tens of meters is needed for full UV protection. Perhaps the organisms used a protective layer of the dead bodies of their brethren. Perhaps this is the origin of the stromatolites - algal mats that would have provided adequate protection for those organisms buried a few millimeters in. Perhaps the early organisms had a protective UV-absorbing case made up of disposable DNA - there is some intriguing evidence of unused modern elaborate repair mechanisms that allow certain cells to repair moderate UV damage to their DNA. However it was accomplished, we know that natural selection worked in favor of the photosynthetic microorganisms, leading to further diversification. The history of macroscopic life on Earth is divided into three great eras: the Paleozoic, Mesozoic and Cenozoic. Each era is then divided into periods. The latter half of the Paleozoic era, includes the Devonian period, which ended about 360 million years ago, the Carboniferous period, which ended about 280 million years ago, and the Permian period, which ended about 250 million years ago. According to recently developed geochemical models, oxygen levels are believed to have climbed to a maximum of 35 percent and then dropped to a low of 15 percent during a 120-million-year period that ended in a mass extinction at the end of the Permian. Such a jump in oxygen would have had dramatic biological consequences by enhancing diffusion-dependent processes such as respiration, allowing insects such as dragonflies, centipedes, scorpions and spiders to grow to very large sizes. Fossil records indicate, for example, that one species of dragonfly had a wing span of 2 1/2 feet. Geochemical models indicate that near the close of the Paleozoic era, during the Permian period, global atmospheric oxygen levels dropped to about 15 percent, lower that the current atmospheric level of 21 percent. The Permian period is marked by one of the greatest extinctions of both land and aquatic animals, including the giant dragonflies. But it is not believed that the drop in oxygen played a significant role in causing the extinction. Some creatures that became specially adapted to living in an oxygen-rich environment, such as the large flying insects and other giant arthropods, however, may have been unable to survive when the oxygen atmosphere underwent dramatic change. The overall composition of the earth's atmosphere is summarized below along with a comparison to the atmospheres on Venus and Mars - our closest neighbors. The variations in concentration from the Earth to Mars and Venus result from the different processes that influenced the development of each atmosphere. While Venus is too warm and Mars is too cold for liquid water the Earth is at just such a distance from the Sun that water was able to form in all three phases, gaseous, liquid and solid. Through condensation the water vapor in our atmosphere was removed over time to form the oceans. Additionally, because carbon dioxide is slightly soluble in water it too was removed slowly from the atmosphere leaving the relatively scarce but unreactive nitrogen to build up to the 78% is holds today. The unit of percentage listed here are for comparison sake. For most atmospheric studies the concentration is expressed as parts per million (by volume). That is, in a million units of air how may units would be that species. Carbon dioxide has a concentration of about 350 ppm in the atmosphere (i.e. 0.000350 of the atmosphere or 0.0350 percent). Click to interactively explore Selective Absorbers. Objects that absorb all radiation incident upon them are called "blackbody" absorbers. The earth is close to being a black body absorber. Gases, on the other hand, are selective in their absorption characteristics. While many gases do not absorb radiation at all some selectively absorb only at certain wavelengths. 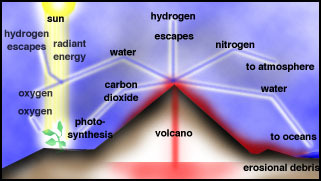 Those gases that are "selective absorbers" of solar energy are the gases we know as "Greenhouse Gases." The interactive activity to the right allows you to visualize how each greenhouse gas selectively absorbs radiation. Wien's Law states that the wavelength of maximum emission of radiation is inversely proportional to the object's temperature. Using that law we know that the wavelength of maximum emission for the Sun is about 0.5 µm (1 µm = 10-6 m) and the wavelength for maximum emission by the Earth is about 10 µm. In the activity to the right see where the greenhouse gases absorb relative to those two important wavelengths. and each have different sources (emission mechanisms) and sinks (removal mechanisms) as outlined below. Sinks Photosynthesis and deposition to the ocean. Importance Accounts for about half of all warming potential caused by human activity. Sources Landfills, wetlands and bogs, domestic livestock, coal mining, wet rice growing, natural gas pipeline leaks, biomass burning, and termites. Sinks Chemical reactions in the atmosphere. Importance Molecule for molecule, methane traps heat 20-30 times more efficiently than CO2. Within 50 years it could become the most significant greenhouse gas. Sources Burning of coal and wood, as well as soil microbes' digestion.. Importance Long-lasting gas that eventually reaches the stratosphere where it participates in ozone destruction. Sources Not emitted directly, ozone is formed in the atmosphere through photochemical reactions involving nitrogen oxides and hydrocarbons in the presence of sunlight. Sinks Deposition to the surface, chemical reactions in the atmosphere. Importance In the troposphere ozone is a pollutant. In the stratosphere it absorbs hazardous ultraviolet radiation. Sources Used for many years in refrigerators, automobile air conditioners, solvents, aerosol propellants and insulation. Sinks Degradation occurs in the upper atmosphere at the expenses of the ozone layer. One CFC molecule can initiate the destruction of as many as 100,000 ozone molecules. Importance The most powerful of greenhouse gases  in the atmosphere one molecule of CFC has about 20,000 times the heat trapping power on a molecule of CO2. We developed a few useful tools for the study of biogeochemical cycles. These include the concepts of the reservoir, fluxes, and equilibria. Atmospheric evolution progressed in four stages, leading to the current situation. The atmosphere has not always been as it is today - and it will change again in the future. It is closely controlled by life and, in turn, controls life processes. Complex feedback mechanisms are at play that we do not yet understand. Oxygen became a key atmospheric constituent due entirely to life processes. It built up slowly over time, first oxidizing materials in the oceans and then on land. The current level (20%) is maintained by processes not yet understood. Sometime just before the Cambrian, atmospheric oxygen reached levels close enough to today's to allow for the rapid evolution of the higher life forms. For the rest of geologic time, the oxygen in the atmosphere has been maintained by the photosynthesis of the green plants of the world, much of it by green algae in the surface waters of the ocean. Selective absorbers in our atmosphere keep the surface of the earth warmer than they would be without an atmosphere.